In Ridley Scott's All the Money in the World, Christopher Plummer's performance is by far the best thing and the scenes in which he appears are the most compelling. The irony of those statements is evident since Plummer wasn't in the original version of the completed film. Whether or not the 88-year old veteran's portrayal of oil magnate J. Paul Getty is better or worse than Kevin Spacey's (whose scenes were re-shot following sexual harassment and abuse allegations lodged against the actor), it doesn't alter the central imbalance that makes this a frustratingly uneven motion picture. When Getty isn't on-screen, the movie is a bit of a bore and it doesn't help that Mark Wahlberg is woefully miscast and the thriller elements are anything but tense or suspenseful. 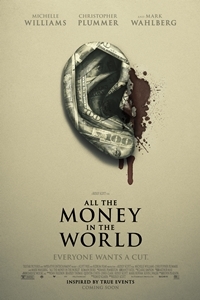 All the Money in the World is loosely based on the 1973 kidnapping of John Paul Getty III (Charlie Plummer), the grandson of tight-fisted billionaire J.P. Getty (Christopher Plummer - no relation), by Italian mobsters. For the teenager's safe return, the criminals demand a $17 million ransom. However, Paul's mother, Gail (Michelle Williams), has no money and Getty is unwilling to part with even a fraction of what is being demanded, declaring that he has 14 other grandchildren and if he pays the ransom, all of them will be kidnapped. Instead of offering money, he dispatches his #1 security man, ex-CIA agent Fletcher Chase (Mark Wahlberg), to find and retrieve Paul. The scenes featuring Paul in the hands of his kidnappers and detailing his interaction with the sympathetic Cinquanta (Romain Duris), are unconvincing. They seem staged and artificial. The aspects of the movie focused on the attempts of Fletcher and Gail to locate and rescue Paul lack suspense. They feel obligatory and Wahlberg's lackadaisical performance makes it difficult to relate to Fletcher on any level. Based on the available evidence, he seems borderline-incompetent, which is at variance with the repeated assertions that he's the best in the business. The movie has gained some notoriety because of the last-minute reworking embarked on by director Ridley Scott in the wake of damning revelations about Kevin Spacey. To save the movie, Scott elected to remove Spacey from the finished project. Choosing Plummer as Spacey's replacement was an inspired decision and the re-shoots (of about 21 scenes) were completed with lightning-fast speed. Anyone unaware of all the behind-the-scenes drama wouldn't be able to detect it the finished product; Plummer's inclusion is smooth and, with the possible exception of one CGI-aided scene, there's nothing to indicate that someone else may have at one point played the role. All the Money in the World shines when Plummer is on screen because Getty is by far the most compelling figure in the film. As is often the case when a supporting player rivets the viewer's attention, this creates an imbalance that the movie is unable to resolve. Getty is audacious and, with Plummer injecting a little humanity into the cold, amoral man, he becomes more than just a two-dimensional anti-hero. But when the movie turns its attention to the participants at the forefront of the kidnapping and rescue, it loses energy. Perhaps part of the problem is what we're told in a voiceover - that members of the Getty family are "different." Perhaps that lack of humanity fuels a certain apathy where Pauls' fate is concerned. The possibility of his death doesn't upset us. It's no surprise that the film looks great. Ridley Scott is a top-notch craftsman even when working with a less-than-masterful screenplay. His ability to rework the production to a significant degree a month prior to its release is a testimony to what an accomplished director can achieve. The problem, however, is that All the Money in the World isn't worth the exceptional effort put into its release. It's a serviceable thriller at best and, although Christopher Plummer's performance is worthy of praise, the film's failing is that it doesn't recognize that the most interesting character by far should have a more prominent part rather than being relegated to a supporting role.